What miracle product could possibly work in all three scenarios? Organic virgin coconut oil. With expert after expert touting its seemingly endless powers, coconut oil starts to sound like some magical elixir. But it isn’t extraordinarily rare or available only in high-end vitamin shops. Coconut oil is not only affordable enough for everyone to keep on hand, but also incredibly useful—to prove it, we’ve rounded up 30 of our favorite uses. P.S. : Get a FREE jar of Thrive Market Organic Virgin Coconut Oil! To remove the dairy from any recipe, swap in room-temperature coconut oil for butter at a 1:1 ratio, by weight. Bonus: it lends a light tropical flavor to everything from cookies to breads! Often heavily processed, vegetable oils should be avoided (even if their name makes them sound healthy). Recent research from De Montfort University has also indicated that cooking with vegetable oils releases toxic, cancer-causing chemicals called aldehydes. Coconut oil, on the other hand, doesn’t contain these chemicals, so substitute it in any recipe that calls for vegetable oil at a 1:1 ratio. Dry toast just isn’t any fun. Instead of butter or jam, use coconut oil for just a hint of sweetness. Coconut oil is super energizing, thanks to its abundance of medium-chain triglycerides (or MCTs)—a type of healthy fat particularly useful for quick energy. Add a spoonful to a smoothie to take things up a notch. Coconut oil and coffee might not seem like an obvious combination, but MCTs and caffeine are a match made in heaven. Try a homemade version of bulletproof coffee—typically made with butter or pure MCT oil—by blending fresh coffee with a tablespoon of coconut oil. The result is a frothy, latte-like beverage without any of the dairy or added sugar. Did you know you can make easy, Paleo-friendly fudge with just five ingredients? Whip up a batch to satisfy your sweet tooth, and don’t leave out the coconut oil—it allows everything to set up in the freezer. Instead of honey, dissolve a little coconut oil in a cup of hot tea and sip—the concoction coats and soothes a scratchy throat and may even help quiet a cough. A central tenet of Ayurvedic medicine, oil pulling is said to remove toxins, promote oral health, whiten teeth, and banish bad breath. To try it, swish a tablespoon of melted oil around in your mouth for 15 minutes, then spit it into the trash. When little ones come home from school with an itchy scalp and a note from the nurse’s office, bust out this DIY lice treatment. First, rinse hair with apple cider vinegar, then comb out the nits. Coat the whole head with coconut oil, leave it on for 8 to 12 hours to smother any remaining lice, then rinse out. Because coconut oil has antifungal and antibacterial properties, it’s a perfect solution for treating rashes. Just massage a small amount into the affected area and wait for it to clear up. Coconut oil can also gently remove makeup and cleanse the skin. Rub a bit of coconut oil all over your face, and wipe clean with a washcloth or cotton pad. Rinse off any excess oil. Chapped lips will be a thing of the past once you try this beauty hack. Use solidified coconut oil as a simple lip balm—slather some on before bed, and the next morning, you’ll have baby soft lips. At-home beauty treatments often call for a base oil, and coconut is our go-to. Mix up a DIY body scrub by combining it with a natural exfoliant, like sugar or coffee grounds. Coconut oil’s moisturizing power doesn’t just help skin—it can also work wonders for your hair. When your tresses are in need of a serious spa treatment, try an avocado hair mask. P.S. : Claim your FREE jar of Thrive Market Organic Virgin Coconut Oil! Get beachy waves any time of year with this three-ingredient spray. Spritz it all over hair to get the piecey texture you want—and condition locks at the same time. Because it’s so hydrating, coconut oil works well as a leave-in conditioner. Work a tablespoon through damp hair, concentrating on dry, brittle ends. Skip the bubble bath and add a tablespoon to the tub for a relaxing soak with a subtle tropical aroma. Most oils work to hydrate skin, but coconut oil is especially well-suited to the job. Apply a small amount anywhere you need a little moisture and rub it in. A little goes a long way! Bug bites or bothersome rash got you down? Turn to coconut oil rather than expensive anti-itch cream. The oil forms a protective coating on the skin, both soothing the affected area and preventing you from doing further damage. You’ve probably already heard the horror stories about conventional antiperspirant: It often contains aluminum, which has been tentatively linked to hormonal imbalances and breast cancer. Skip it and mix up a DIY coconut oil deodorant to keep B.O. at bay. P.S. : Try coconut oil at home with your FREE jar from Thrive Market! Dip a clean mascara wand in melted (but cooled) coconut oil for a plumping mascara alternative. Bonus tip: Leaving it on overnight conditions and strengthens eyelashes. Store-bought candles—even the fancy ones—often contain artificial fragrances and wax made from petroleum. 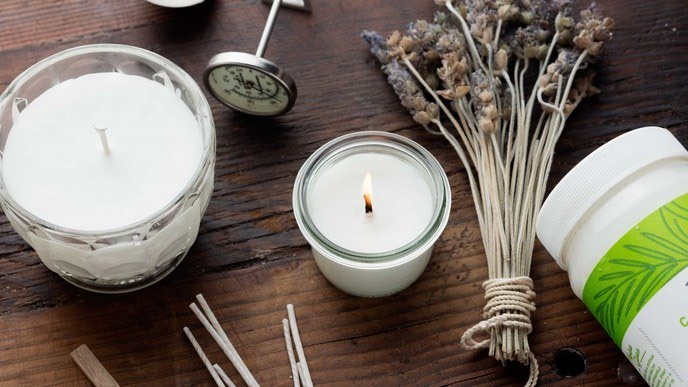 Make your own candles at home with just beeswax, coconut oil, and the essential oils of your choosing—it’s not only way more natural, but also incredibly cost efficient. All you need is a Q-tip and some coconut oil to stop door hinges from making noise. Just dip one end in the oil, apply it all the way down the hinge, and move the door back and forth until it stops squeaking. Shaving causes tiny abrasions on the skin, and these little cuts can easily get infected by bacteria and cause breakouts. That’s where aftershave comes in, to help soothe and clean irritated skin. Coconut oil is a good substitute for a store-bought product, because it’s naturally antibacterial. Coconut oil’s pleasant, nutty scent and silky texture make any massage feel like a spa treatment. After shaving, short, stubbly hairs sometimes curl back into the follicle, creating painful ingrown hairs. The cure? Exfoliating with an antibacterial coconut scrub. Just mix ½ cup coconut oil with 1 cup brown sugar, massage all over the affected area, and wash off. Even if you keep your nails expertly polished, ragged cuticles can ruin the whole look. Massage some coconut oil into the base of nails for a salon-like deep conditioning treatment daily (it helps prevent chipping, too). Scents have the power to calm you down, focus your mind, and even totally change your mood. Harness the tropical scent of coconut oil by dabbing a bit on your wrists, and imagine you’re jetting off to an island getaway. You can add other essential oils if you like, too. If the zipper on your favorite pair of jeans keeps catching, apply a small amount (not enough to stain) of coconut oil along the teeth to get it moving smoothly again. Attention, well-coiffed men! Solidified coconut oil works just as well for taming short ’dos and beards as pricy styling products. Not only is it way cheaper, but it’s also naturally conditioning and sweet smelling. Rub a small amount of coconut oil (no more than a teaspoon) all over boots, bags, belts, and other leather goods with a soft cloth to get them looking like new.